The following Roller Assembly uses semi-tubular rivets in multiple locations. These popular rivets are used to permanently fasten two or more pieces. They are strong, inexpensive and well-suited for high-speed assembly operations with automatic feed riveting machines. 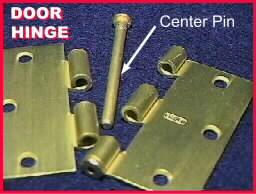 The Door Hinge and Pulley applications below both use solid rivets for strength and durability. 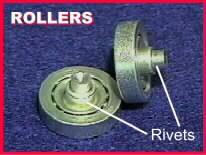 The shoulder in the roller application below acts as a bearing surface for the nylon rollers. Shoulder rivets offer a lower unit cost than similar screw machine parts, and can be assembled with automatic feed riveting machines. Collar rivets are a variation of the Shoulder Rivet. They can be used as standoff to separate components, as a guide peg for mating assemblies, or as an anchor stud for a pivoting assembly. 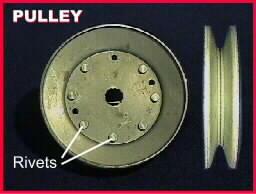 Collar rivets are a variation of the Shoulder Rivet. They can be used as a standoff - to separate components; or as a guide peg for mating assemblies; or as an anchor stud for a pivoting assembly. 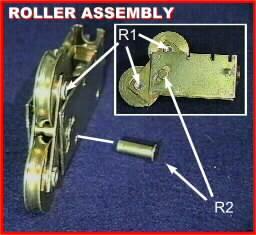 In the Roller application below, a collar rivet is fastened to the ID of a ball bearing. 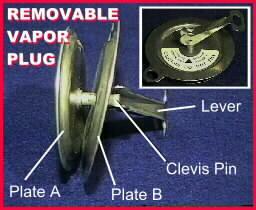 Not shown - Annular ring (elastomeric) is compressed between plates, thereby expanding to provide vapor seal.